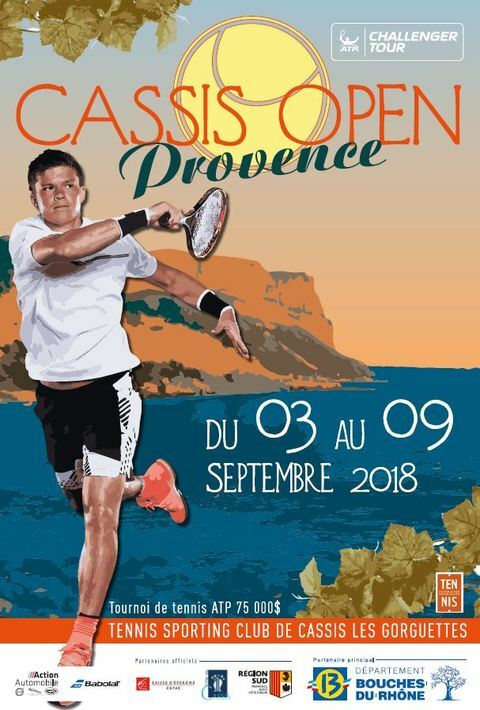 The 1st edition of the Cassis Open Provence will take place from 3 to 9 September 2018 at Sporting Club des Gorguettes, in Cassis. This new sports event of national renown is a great first for the city of Cassis. The draw consists of 32 singles players and 16 doubles teams who will compete on the hard courts of the Sporting Club de Cassis. It replaces the Trophée des Alpilles and promises to host a high-quality sports field. The Cassis Open Provence is also a festive event. During the whole week, you will be able to attend the last games in a convivial atmosphere before leaving place to the various musical groups which will animate the evenings. Qualifications will take place on Sunday 2 and Monday 3 September from 11am. Monday September 3rd and Tuesday September 4th start of the first round of the Final Draw from 11am until the evening. The draw for the final tableau will take place in the VIP village on Monday 3 September at 11am and will be open to all. The tournament final will take place on Sunday 9 September at 2pm. Admission is free throughout the whole week. A high level sporting competition and the various animations proposed make the Cassis Open Provence an appointment not to be missed!